Add clean, sophisticated style to your bedroom with the Miller 3-piece Duvet Cover Set. This set features a soft 100-percent cotton construction with an embroidered border pattern that you will be sure to love. I'm happy with my purchase -- I did not expect the finest quality cotton because the price is so low, but the duvet cover seems to be of solid construction, and held up well to the washing machine. There are maybe 2 small (1.5-2 cm) darker "lines" or marks in the fabric that I noticed while making the bed, but they're hardly noticeable. I am using these as guest room sheets. Not sure how well they'll hold up over time, but I love the look of them, and for the price I think they're a great value and I would buy them again! This duvet is outstanding quality. I am so happy I ordered the duvet set. It look beautiful on my bed and far more expensive than it was. Just what I was looking for. Love the ribbon pattern on top. It goes all around. I bought the grey. It is a very dark grey almost black. Not as soft as some of my other covers but I can live with that. This king duvet is great for the price. It is really a beautiful bed set. You can wash it and the black does not run into the white. I highly recommend this duvet set for everyone! The quality of the duvet is wonderful. It is soft and the yellow color is accurate in the picture. I love it! 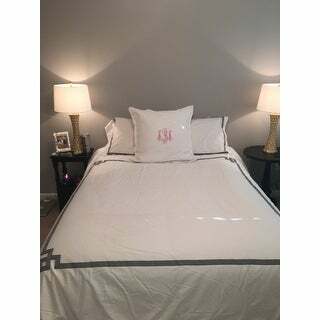 The material was much coarser cotton than previous 100 percent cotton duvet covers and it's also heavier which is nice in the winter but will not be helpful in warmer months. I absolutely love this duvet. I recently upgraded from a queen size bed to a king which means I am purchasing all new bed linen. I purchased this duvet and I love it. I've washed it a few times, it holds up very well. It gives the bed a polished organized feel and fits over my down comforter with ease. Great value and looks lovely. The yellow border really pops and adds just the right amount of contrast color and design. I have washed the duvet and pillowcases and they hold up very well. Excellent purchase. This is a really nice duvet cover and wrinkles after washed but not too badly. I have washed a few times and the material and stitching around the border has not faded or become loose. It looks much nicer for such an inexpensive price. I like the detail rather than a straight border than you can find commonly. I bought the white with black border. This duvet and sham set is very clean cut and classic. It pretty much goes with everything and the fabric softens after a few washings. This is a beautiful set!! I'm very happy with my buy!! Need really full thick pillow inserts for the shams or they don't stand up. See pic below. My daughter got this for her college apartment. It looks nice for the pice. Looks better ! Sof and yes perfect. Very much what I wanted. Great values for price. Looked elsewhere but this was best deal. Very satisfied. Color is perfect for any room. I wasn’t sure about the quality because the price was so affordable but was very pleased when I received. One quick wash and dry and was soft. Ready to use. Beautiful duvet. Clean, crisp and eye catching. Excellent value. This bedding makes my room look like a chic hotel room and I love it. It's clean and classy. It is made with high quality fabric and I've spilled things on it and it comes out easily. I've even bleached it and the black didn't change color. I'm very happy with my purchase. Great duvet. We have owned it for over a year and it has held up very well with a lot of washing. I would purchase again for the price and quality. Good quality material and I love the simplicity of it. "is the black a white duvet with black trim or a black duvet with white trim?" "Where can I buy extra pillow shams in this same design? Either 2 more standard pillow shams or two Euro pillow shams? (White with black embroidery) "
No zipper. It has clear buttons at one end. "is the " gold" a true gold or is it a yellow gold?" Hello kloflin, the color is more of a yellow-gold in my opinion. We try to represent the colors of our products accurately. Unfortunately, due to the difference in monitor colors we cannot guarantee that the color will match exactly what you see on your screen. Thank you for shopping with us. "Is duvet reversible. For example is it white on underside and appropriate to use this way?" Hello CC, yes the back is white. Have a great day! "How opaque is the duvet cover? If the comforter inside is dark/patterned, will it show through?" Hello forrester, thank you for your inquiry. Unfortunately, the information you have requested is currently unavailable. You will receive an email notification once an answer is posted. Have a great day. "Is the gray color a true gray? I'm having a hard time finding a gray that doesn't have a purple tone in it." Hello ST, yes, it's a true grey. Thanks for shopping with us!